The Black Mamba is a private anti-poaching unit (APU) founded in 2013 by Transfrontier Africa with initial duties to protect the Olifants West Region of South Africa’s Balule Nature Reserve. It has since expanded to protect all of the Balule Reserve. The Balule Reserve is on the western side of South Africa’s famous Kruger National Park, a park that is home to many protected species such as rhinos, elephants, lions, zebras, pangolin, buffalo, giraffe, hippos, cheetahs, leopards, crocodiles, and many more. The Mamba consists of 26 women from disadvantaged communities bordering the park. They have undergone 6 weeks of paramilitary training and wildlife education and now work alongside 23 armed guards and an intelligence team to protect 40,000 hectares (approx. 154 sq. miles). Typical tasks include walking several miles a day patrolling perimeter fences, searching for signs of poachers, reporting animals that have been poached, searching for and dismantling traps, installing wildlife tracking collars, and helping care for animals that have been injured or were separated from their mothers. Typical working conditions can be physically demanding, with temperatures typically reaching upwards of 100°F. The Mambas also work among potentially dangerous wildlife and hostile poachers. Their job doesn’t stop when they leave the Reserve Mambas also conduct the Bush Baby Environmental Education Program, an environmental awareness program that is currently integrated into several local primary schools that reach several hundred students. The program’s objectives are to educate the youth about their surrounding ecology and give them a better understanding of conservation by raising awareness of their environment and instilling better environmental problem-solving skills that will serve them well as environmental caretakers for South Africa’s future. Six months prior to formation of the Black Mambas APU, 16 rhino fatalities occurred within the Balule Reserve. Within 12 months after the Mambas began patrolling, the reserve had only three rhino fatalities. Since this APU formed, the Balule Reserve has reported a 76% decline in snaring and poisoning activities. The success of the Black Mambas has not gone unnoticed. Last year the Mambas received the Champions of the Earth award , the UN’s highest environmental honor awarded to those showing tremendous courage in the fight against the illegal wildlife trade. This year the Mambas will receive the Innovation of Conservation award from the UK charity Helping Rhinos. The award is given in recognition of the Mambas’ “inspiring and innovative approach” that has yielded such positive results in protecting the rhino. The UN and Helping Rhinos aren’t the only organizations to recognize the Mambas’ success. South Africa’s National Parks Authority is planning to replicate the Black Mamba model, with plans for another team of six female rangers. Why Has Poaching Become a Problem? Each Mamba receives a salary but also relies on donations from organizations such as Sponsor a Black Mamba for compensation. There are also other donation campaigns as well as several sponsors and partners that aid in keeping proper funds available for the Black Mambas to continue having necessary equipment in the field and enough funds to continue offering their environmental education courses to the youth. Giving money is one of many ways to support these trail-blazing women with their efforts in conservation. Perhaps simply sharing their inspirational story may give rise to other courageous conservation efforts. This Saturday, January 28, from 9:00 am to 1:00 pm, the City of Gainesville will host the 3rd annual “Great Invader Raider Rally”. The rally is a 1-day volunteer-powered event to remove trash and non-native invasive plant life from around Gainesville’s city parks. The first portion of the event will be the clean-up effort and will take place from 9:00 to 11:00 am in pre-selected natural areas around Gainesville. The second portion of the event will be the celebration and will take place from 11:00 am to 1:00 pm at Morningside Nature Center. The celebration will feature live music from local band “Wax Wings” as well as prizes from local businesses to honor the top volunteers of 2016. All volunteers in this event must be registered. Registration ended January 27 with a whopping 913 participants registered! As a thank you, all participants will receive a commemorative Raider Rally t-shirt designed by local artist Molly Kempson and will feel gratified in knowing that local plant life now has a better chance to prosper. The “Great Invader Raider Rally” is part of the “Gainesville Greenway Challenge” (GGC), a community/volunteer based invasive species removal effort, with participants meeting the first Saturday of every month. GGC funding is provided by a grant from Environmental Solutions for Communities, which is a $15 million 5-year initiative launched in 2012 by Wells Fargo Bank and the National Fish and Wildlife Foundation (NFWF). If you live in Florida you’ve probably heard people talk about coyotes (Canis latrans [Exhibits 1 and 2]) in Florida. Below are facts gleaned from the literature regarding this interesting mammal. How Did the Coyote Get Its Name? The accepted common name ‘coyote’ comes from the Aztec term for the species, Coyotl. Other names used for this species in North America include coyóte (Mexican), brush-wolf, prairie-wolf, American jackal, and little wolf (Beebe 1964). Why Did Coyotes Expand Their Range into the Eastern United States and Florida? Most of us know that coyotes are not native to the eastern U.S., including Florida. Their range has historically been limited to the western U.S. (Layne 1997). Humans eliminated gray wolves and red wolves from the eastern U.S. in the early- to mid-1900s, with the red wolf being last recorded in Florida at that time (Beebe 1964). Wolves were apparently a major constraint on the range of the coyote, so their recent absence from parts of the U.S. allowed for the natural expansion of the coyote’s range. Thus, the expansion of the coyote into Florida and elsewhere in the eastern U.S. is most likely due to humans extirpating the wolves in this area. Humans may have helped the coyote become established in Florida through accidental release or escape and (or) intentional release (Layne 1997), such as for hunting. What Habitats Do Coyotes Use Most Often? In Florida, coyotes frequent improved pastures, native prairies, and citrus groves according to a survey by R. McBride cited in Layne (1997). Den sites are located along brushy slopes, areas of thick undergrowth of vegetation, inside hollow logs, within rocky ledges, and burrows made either by adult coyotes or by other mammals. Tunnels leading to the den may be 5 to 25 feet long (1.5 to 7.5 meters). The den chamber itself measures about 1 foot (0.3 meters) in width and is commonly located 3.3 feet (1 meter) below-ground. Coyotes may undertake seasonal migrations between habitats in some areas of North America (Novak 1999). What Is the Average Size of the Coyote’s Home Range? A coyote can cover a distance of about 2.5 miles (4 km) in a night while searching for a meal. They traveled an average distance of 19.3 miles (31 km) from the point of capture in a tagging study in Iowa, but one individual covered a whopping 200 miles (323 km) during that study (Novak 1999). A coyote tagged in south-central Canada traveled a record distance of 338 miles (544 km) from the point of capture (Carbyn and Paquet 1986). Home range sizes vary greatly, from 3 to 31 square miles (8 to 80 km2). Males have larger home ranges than do females, and male ranges overlap one another considerably. Females ranges are smaller and do not overlap with those of other females (Novak 1999). What’s the Average Population Density for Coyotes? Population densities are generally between 0.1 and 0.2 coyotes per square mile (0.2 to 0.4 individuals/km2), but can be as high as 1.2 individuals per square mile (2.0/km2) in areas having extremely favorable conditions (Knowlton 1972, Bekoff 1977). A study of coywolves (hybrid of coyote x eastern gray wolf [Canis lupus lycaon]) living north of Boston, Massachusetts, found a very high population density in fall and winter, at 1.1 to 1.3 individuals per square mile (2.9 to 3.4 individuals/km2) and 0.8 individuals per square mile (2.0 individuals/km2), respectively (Way 2011). When Are Coyotes Most Active? Coyotes can be active at any time of day or night, but they are mainly nocturnal and crepuscular (Novak 1999) (crepuscular means active around dawn and dusk [insect-eating bats are another example of crepuscular mammals]). Does a Coyote Sighting Mean They Are More Common in the Area Than in Other Areas? Coyotes are found in every Florida county. Their level of abundance cannot be measured merely by anecdotal sightings since coyotes try to blend in with their surroundings and not be seen. Sightings of coyotes do not necessarily mean that they are more abundant where sighted. Coyotes are wherever there is suitable habitat, regardless of whether or not they are seen. A sighting only confirms that coyotes are present. Coyotes mainly eat small mammals. Rabbits and rodents make up the bulk (90%) of their diet in most areas. Larger animals such as deer are also commonly eaten, but mostly as scavenged carcasses, although sometimes after a chase in which several coyotes worked together to take down the animal. Other food items include fishes (which they are capable of snatching from streams! ), lizards, snakes, birds such as turkeys, insects, grasses, fruits (including watermelon, persimmon, and various wild berries), and seeds (Novak 1999, Coates et al. 2002). A tracking study conducted in Tucson, Arizona, found that over a 33-day period during November 2005 through February 2006, a group of eight coyotes killed 19 domestic cats (Harris Environmental Group 2015). This interesting study further strengthens the idea that domestic cats are much better off if kept entirely indoors. The coyote is also capable of preying on small domestic dogs (McCown and Scheick 2007). Livestock are occasionally taken but the impact on livestock numbers is minimal (Novak 1999). In the western U.S., where coyotes share their range with American badgers, the two species have been documented to form hunting partnerships whereby the coyote uses its excellent sense of smell to locate burrowing rodents, and the badger uses its powerful legs and claws to dig out the prey, which they then share (Novak 1999). How Often Do Coyotes Prey on Domestic Livestock Like Cattle? It is true that coyotes can kill and consume livestock including calves, poultry, pigs, and goats (Coates et al. 2002). However, coyotes are not a serious problem to livestock (with the possible exception of sheep [Coates et al. 2002]) in most parts of their range, and reports of livestock damage from this species appear to be driven by popular perception and emotional reactions. In the words of the past Chief Game Biologist for Mississippi, H.E. Alexander, “Reports of livestock damage from these animals seems to be more dependent on popular attitudes and emotional reactions to conspicuous evidence of depredations at some time and place than on actual fluctuations [of coyote populations]” (Beebe 1964). Coyotes are not a major concern to livestock producers in Florida according to McCown and Scheick (2007). What’s the Average Size and Weight of an Adult Coyote? Adult male coyotes weigh 18 to 44 pounds (8 to 20 kg). Adult females weigh 15 to 40 pounds (7 to 18 kg). Coyotes living in northern regions weigh more, on average, than do those living in southern regions of North America (Nowak 1999). The average weight of a coyote in Alaska is 40 pounds (18 kg), contrasting with the average weight of 25 pounds (11.5 kg) for coyotes living in the deserts of Mexico according to Gier (1975). An unusually heavy coyote from Canada that weighed 46 pounds (21 kg) was noted by Beebe (1964). The largest coyotes are those living in the northeastern United States, owing to enhanced nutrition there and (or) hybridization with the gray wolf (Nowak 1999). In general, coyotes are larger than foxes but smaller than wolves (Coates et al. 2002). How Fast Can Coyotes Run? Coyotes are very speedy runners! Picture this: a coyote racing in the World Championships in Athletics against legendary world record-holder Usain Bolt. Usain runs a breathtakingly fast time of 9.58 seconds for the 100‑meter sprint. That’s 23.4 miles per hour (mph) (37.7 km/hour)! Now, let’s focus on the coyote. The coyote explodes out of the starting line at a staggering pace, crossing the finish line in about half the time (4.47 seconds) it took Usain to cover the same distance! That’s right, coyotes are fast and capable of running at speeds of up to 50 mph (80.5 km/hour) (Sooter 1943, Fisher 1975). Although Novak (1999) gives a top speed of 64 mph (103 km/hour), this is higher than what is stated by most other sources. Coyotes are clearly one of the fastest terrestrial mammals in North America. Litter size averages about 6 pups but ranges from 2 to 12 pups. Large numbers of pups have been found in a single den but were probably the result of litters from more than one female. Females produce only one litter annually (Novak 1999). Mating occurs during January through March, and gestation takes about 2 months (Coates et al. 2002). Parturition (birthing) takes place in spring. The pups weigh only about 8.8 ounces (250 grams) at birth. Their eyes don’t open until day 14. Young emerge from the den within about 3 weeks of birth and are fully weaned at about 9 months, at about which time they approach the weight and size of adult coyotes. The average life span is less than 6 years, with the most significant mortality being within the first year of life (Coates et al. 2002). The maximum longevity was recorded at 14.5 years in the wild, but most wild coyotes do not survive this long. One long-lived captive coyote lived 21 years and 10 months (Jones 1982). Do Coyotes Sometimes Hybridize with Other Canids? Coyotes are well known to interbreed with domestic dogs (producing what are called ‘coydogs’). Coyotes also interbreed with eastern gray wolves (Way 2011) as well as with red wolves (Canis lupus rufus), producing ‘coywolves’. The offspring produced are fertile. What Are the Regulations on Hunting Coyotes in Florida? The hunting and trapping of coyotes is allowed year-round throughout Florida (http://myfwc.com/‌hunting/season-dates). However, a permit from the Florida Fish and Wildlife Conservation Commission (FWC) is needed for using steel traps, such as leg-hold traps. More information on how to apply for a steel trap permit is found at http://myfwc.com/license/wildlife/nuisance-wildlife/steel-traps/. FWC keeps a list of nuisance-wildlife trappers at https://public.myfwc.com/HGM/NWT/NWTSearch.aspx?. Photo courtesy of Justin Johnsen and Wikipedia Commons. Beebe, B.F. 1964. American Wolves, Coyotes, and Foxes. David McKay Co., Inc., New York, NY. Bekoff, M. 1977. Social behavior and ecology of the African Canidae: A review. Pp. 120–142. In: M.W. Fox (ed.) The Wild Canids: Their Systematics, Behavioral Ecology and Evolution. R.E. Krieger Publishing Co., Inc., Malabar, FL. Brady, J.R. and H.W. Campell. 1983. Distribution of coyotes in Florida. Florida Field Naturalist 11:40–41. Carbyn, L.N. and P.C. Paquet. 1986. Long distance movement of a coyote from Riding Mountain National Park. Journal of Wildlife Management 50:89. Coates, S.F., M.B. Main, J.J. Mullahey, J.M. Schaefer, G.W. Tanner, M.E. Sunquist, and M.D. Fanning. 2002. The Coyote (Canis latrans): Florida’s Newest Predator [online resource]. Wildlife Ecology and Conservation Dept. document WEC124, Florida Cooperative Extension Service, Institute of Food and Agricultural Sciences, UF, Gainesville, FL. Accessed 04/22/15 at http://edis.ifas.ufl.edu/pdffiles/UW/UW12700.pdf. Fisher, J. 1975. The plains dog moves east. National Wildlife 13(2):1417. Gier, H.T. 1975. Ecology and behavior of the coyote (Canis latrans). Pp. 247–262. In: M.W. Fox (ed.) The Wild Canids: Their Systematics, Behavioral Ecology, and Evolution. Van Nostrand Reinhold, New York, NY. Harris Environmental Group, Inc. 2015. Coyote’s Eat Cats! [online resource]. Accessed 04/22/15 at http://www.heg-inc.com/2009/08/coyotes-eat-cats/. Jones, M.L. 1982. Longevity of captive mammals. Der Zoologische Garten 52:113–128. Knowlton, F.F. 1972. Preliminary interpretations of coyote population mechanics with some management implications. Journal of Wildlife Management 36:369–382. Layne, J. 1997. Nonindigenous mammals. Pp 157–186. In: D. Simberloff, D.C. Schmitz, and T.C. Brown (eds. ), Strangers in Paradise, Impact and Management of Nonindigenous Species in Florida. Island Press, Washington, D.C.
MacCown, W. and B. Scheick. 2007. The Coyote in Florida [online resource]. Florida Fish and Wildlife Research Institute, Florida Fish and Wildlife Conservation Commission, Tallahassee, FL. Accessed 04/22/15 at http://myfwc.com/media/1228800/CoyoteWhitePaperFinal.pdf. Nowak, R.M. 1999. Walker’s Mammals of the World, Sixth Edition, Volume I. The Johns Hopkins University Press, Baltimore, MD. Sooter, C.A. 1943. Speed of a predator and prey. Journal of Mammalogy 24:102–103. Way, J.G. 2011. Record pack-density of eastern coyotes/coywolves (Canis latrans x lycaon). The American Midland Naturalist 165(1):201–203. Webb, S.D. 1974. Chronology of Florida Pleistocene mammals. In: S.D. Webb (ed. ), Pleistocene Mammals of Florida. University Press of Florida, Gainesville, FL. Wilson, L.D. and L. Porras. 1983. The Ecological Impact of Man on the South Florida Herpetofauna. The University of Kansas Museum of Natural History Special Publication No. 9, University of Kansas, Lawrence, KS. Wooding, J.B. and T.S. Hardisky. 1990. Coyote distribution in Florida. Florida Field Naturalist 18:12–14. NOAA Holds Public Comment Period for a Proposed Rule That Will Enforce Marine Mammal Protection from International Fisheries Exporting into the U.S.
NOAA’s proposed rule will require foreign fisheries that export fish and fish products into the United States to comply with U.S. marine mammal conservation standards and regulations. These fisheries can choose to adopt presently established U.S. regulatory programs and fishing methods or they can choose to establish other programs and fishing methods that will be equally as effective as compliance with U.S. standards. In a 2005 report, the U.S. Ocean Commission estimated that the worldwide bycatch rate of marine mammals is more than 600,000 a year. The implementation and enforcement of this rule have the potential to be a significant ‘game changer’ in the fishing industry. According to the 2014 NOAA Fisheries report, the U.S. (including all 50 states, the District of Columbia, Puerto Rico, and the U.S. Virgin Islands) imported $20.2 billion of edible fishery products and $15.6 billion of inedible fishery products, creating a combined $35.9 billion industry. During 1999, the combined imported edible and inedible fishery products were valued at $17 billion. NOAA Fisheries. Current Fishery Statistics NO. 2014-2: Imports and Exports of Fishery Products Annual Summary, 2014 Revised. Check out the Federal Register to read the complete proposed rule. The comment period will close November 9, 2015. The Bryde’s whale (Balaenoptera edeni) is a tropical member of the baleen family and can be found around the globe between 40°N and 40°S. The Bryde’s whale is represented by two subspecies that live in different regions: Balaenoptera edeni are found in the Western Pacific, coasts of Asia, and possibly Australia, and the Balaenoptera brydei are found in the Atlantic, Pacific and Indian oceans and in coastal South Africa. The last abundance survey performed in the Gulf of Mexico was in 2009 and found only 33 remaining Bryde’s whales. In September 2014, the Natural Resources Defense Council (NRDC) filed a petition to the National Marine Fisheries Service (NMFS) requesting that the Gulf of Mexico population of the Bryde’s whale be listed as ‘endangered’ under the Endangered Species Act. During the first week of April 2015, NMFS stated that there is sufficient scientific evidence to consider granting protected status and has announced the start of a 90-day findings petition to solicit any additional information from interested parties. The importation of marine mammals and marine mammal products into the U.S. If the Bryde’s whale becomes listed as endangered, the species would receive much more protection, including. The Gainesville Sun will be holding a forum to discuss land and water conservation and other topics. More information as quoted from The Gainesville Sun follows. “The Gainesville Sun is holding a forum on land and water conservation, including a discussion of how state lawmakers are planning to spend Amendment 1 money. The forum will be held March 19 at 7 p.m. at the University of Florida’s Pugh Hall. The event and parking are free and open to the public. The event will include a panel discussion featuring Ramesh Buch, who manages the Alachua County Forever land conservation program; Greg Galpin, a Plum Creek Timber Company official who has worked on local conservation easements; Pegeen Hanrahan, former Gainesville mayor and deputy director of the Amendment 1 campaign; and Charlie Houder, who spent 28 years in public land acquisition and management with the Suwannee and St. Johns River water management districts. Sun editorial page editor Nathan Crabbe will moderate the discussion. Photo above taken on the Silver River in Ocala Florida courtesy of www.wikimediacommons.com. FWC has moved forward in trying to obtain more data concerning certain Gulf reef fish by offering a no-cost Gulf Reef Anglers fishing license in trade for information concerning certain species. Through this program FWC will be able to contact Gulf Reef Fish Anglers and gather information concerning their catch in order to gain a better understanding of what is happening below the water’s surface. Visit the FWC website for more information. Recently, there has been considerable interest and research regarding the laurel wilt disease, which affects members of the Lauraceae family, most notably red bay (Persea borbonia) and swamp bay (Persea palustris). This article attempts to summarize the aspects of this disease that are of particular interest to land owners and land managers of Florida and elsewhere in the southeastern United States. The disease Laurel wilt is spread by a nonindigenous beetle called the Asian red bay ambrosia beetle, Xyleborus glabratus. This beetle measures only about 2 mm in length and is cigar-shaped and amber-brown to black in color. This species has significantly less hair on its dorsal surface and is shinier than other species of ambrosia beetles. The female ambrosia beetle spreads a nonindigenous fungus, Raffaelea lauricola, into the sapwood of a tree by boring pinhole-sized holes into the branches or trunk and either actively or passively depositing spores of the fungus in the tunnels. The fungal spores are carried by the beetle in specialized pouch-like structures called ‘mycangia’ that are located at the base of each mandible. Both adult and larval ambrosia beetles feed on the fungus growing in the tunnels. Larvae are white with an amber-colored head. Unlike most other species of ambrosia beetle, which attack dead or dying trees, the Asian red bay ambrosia beetle attacks healthy trees. The native range of the fungus includes India, Japan, Taiwan, Burma, Bangladesh, and Myanmar. As you probably guessed, the Asian red bay ambrosia beetle is native to Asia, including the same countries that the fungus is native to. The exact mechanism that causes death to a tree infected with the fungus and symbiont ambrosia beetle to die is unknown. In simplified terms, the death of the tree is the result of it over-reacting to the presence of the pathogen. The ambrosia beetle and associated fungus are thought to have arrived in the United States from Asia in untreated wood (such as wooden pallets) or in logs. They were first detected in the United States in Port Wentworth near Savannah, Georgia, in May 2002. The disease has since spread throughout the Southeast, from North Carolina south to Florida and west to Mississippi. What Tree Species Does Laurel Wilt Infect? Although the beetle is named Asian red bay ambrosia beetle, it actually infects several other species, including both native trees and introduced trees of importance to the agricultural and ornamental plant industries. Below is a list of species known to be susceptible to Laurel wilt. The female ambrosia beetle, attracted to the smell of a red bay tree, bores into the branches or trunk of the tree and deposits spores of the fungus in the tunnels. Initial symptoms are wilting of the leaves. Often, wilting is seen in all the leaves associated with the distal portion of an infected branch. More and more leaves begin to wilt over time as the disease progresses. Mild discoloration may be seen in the sapwood and can escalate to extensive black/brown streaking over time. Frass tubes, looking like white bent straws sticking out from the bark, begin to appear months later as beetle activity increases. It can take as little as a week for a tree to die from laurel wilt during the warm summer months. Both adult ambrosia beetles and their larvae feed on the fungus growing in the tunnels. It takes some 30 days from the time the eggs hatch to the development of adult ambrosia beetles. Males are smaller than females, lack wings, and are haploid. Females are winged and are diploid. The fungus can remain alive inside a standing dead tree for at least 1 year according to recent research. The biology of laurel wilt disease remains poorly understood, and there is significant research to be done to understand the mechanisms involved in susceptibility and resistance. It is no longer logistically feasible to eradicate or stop the progression of the disease considering how widely distributed it is in the southeastern United States. However, one way to slow the spread on a given site is to cut down and chip dead trees killed by the disease and place the wood chips into piles. The fungus was found to die about 2 days following chipping, and the ambrosia beetle population of the tree was found to be reduced by 99% following chipping. The chipping will also reduce the wood available for female beetles to reproduce. Use of the fungicide propiconazole (Alamo®), injected into the tree, was found to be only mildly effective (approximately 60% survivorship) at protecting red bay trees from the disease. This treatment is expensive and testing for use against Laurel wilt has been limited so far. Best results are achieved by systemic injection before any symptoms of the disease are observed on the tree and the pruning of any diseased areas following treatment. Another method of injecting fungicide, developed by Arborjet®, involves delivering smaller amounts of fungicide using microinjectors. The results of the effectiveness of the Arborjet® method have not been published as of this writing. Similarly, the results of the effectiveness of applying fungicide to the soil around a tree have yet to be published. Fungicides should be administered only by a knowledgeable professional or by the homeowner and in accordance with the instructions and mixing rates on the label. Insecticides are unlikely to be useful at protecting a tree again the ambrosia beetle. Broadcast spraying would be harmful to the environment and to beneficial insects, is not likely to be effective against the ambrosia beetle, and is therefore strongly discouraged. An attempt was made to protect some trees in Volusia County, Florida, by spraying Pinesol® as a way of “hiding” the trees from detection by the ambrosia beetle. Pinesol® spraying took place at about 6‑ to 10‑week intervals. However, all treated trees eventually contracted the disease and subsequently died. It is possible that baits may be developed in the future that may be more attractive to the beetles than are the trees, but at this point in time no compounds have been identified for use as baits. Anyone can help reduce the spread of the ambrosia beetle and the associated Laurel Wilt disease. Refrain from moving untreated firewood far distances. The State of Florida prohibits movement of untreated firewood farther than 50 miles within the state. When camping, buy only local firewood or use certified firewood rather than bringing your own. When traveling abroad, do not bring back untreated wood products or raw plant parts (including seeds or fruits). Laurel wilt disease is one of at least a dozen tree diseases and insect pests within Florida or neighboring states. Minimizing the movement of untreated wood and firewood can help reduce the spread of insect pests and diseases such as the emerald ash borer (kills ash trees), Asian longhorned beetle (kills maples), oak wilt and bot canker of oaks (kills oaks), spiraling whitefly (kills several native and ornamental trees), walnut twig beetle and thousand-cankers disease (kills walnuts), sudden oak death (kills oaks), and others. The reader is encouraged to visit the website www.dontmovefirewood.org for more information. Global Invasive Species Database. 2010. Global Invasive Species Database, Raffaelea lauricola (fungus) [online database]. Accessed 10/17/2014 at http://www.issg.org/database/species/ecology.asp?si=1549&lang=EN. Global Invasive Species Database. 2010. Global Invasive Species Database, Xyleborus glabratus (insect) [online database]. Accessed 10/17/2014 at http://www.issg.org/database/species/ecology.asp?si=1536. Spence, D. and J. Smith. 2013. The status of Laurel Wilt. Palmetto 30(3):4–5, 8–10. U.S. Department of Agriculture, Forest Service. 2013. Laurel Wilt Distribution Map [online resource]. Accessed 10/17/2014 at http://www.fs.fed.us/r8/foresthealth/laurelwilt/dist_map.shtml. A new app has been developed with the collaboration of government agencies, academic institutions, non-profit conservation groups, and private-sector companies to help reduce the chance of fatal ship strikes by displaying near real-time warnings along both the US and the Canadian Coasts. The app will display nearby whale sightings, active management areas, recommended routes, areas to be avoided, and required whale reporting areas. The app also features a photo-capture option to help identify which species of whale is being sighted and a description along with the GPS coordinates of the sighting. The maritime community and the public can report these sightings. The reports will be relayed in real time to leading whale researchers and state and federal management authorities. In some cases, whale sightings may provoke “over-flights” by either the National Marine Fisheries Service or the U.S. Coast Guard, who will then determine whether if there is a need to create temporary speed restrictions for the area. For more information on Whale Alert, visit http://www.whalealert.org. Similar apps have been developed for manatees and sharks and can be downloaded for free via iTunes in the Apple App Store. EPA has won a ruling in the Supreme Court on proposing emission guidelines for greenhouse gases emitted by fossil-fuel-fired electric generating units. Although there are limits at power plants for pollutants such as arsenic and mercury, there are no national limits on carbon emissions. On June 2, 2014, under President Obama’s Climate Action Plan, EPA proposed a Clean Power Plan to cut these emissions. According to EPA’s website, power plants account for one-third of all domestic greenhouse gas emissions. Within the power sector, the plan is predicted to cut back the emissions by 30% from 2005 levels. The plan will also cut pollutants that cause soot and smog by more than 25% by 2030. According to the website, the plan estimates the public health benefits to be worth an estimated $55 billion to $93 billion in savings by the year 2030. Included is the prevention of 2,700 to 6,600 premature deaths and 140,000 to 150,000 asthma attacks in children. The plan is also predicted to shrink power bills by 8% by 2030. During the week of July 28, 2014, EPA will hold four public hearings on the proposed Clean Power Plan in Atlanta, GA; Denver, CO; Pittsburgh, PA; and Washington, DC. EPA is now holding a public comment period. All public comments on the Clean Power Plan Proposed Rule must be received by October 16, 2014. Directions for how to comment on the Clean Power Plan Proposed Rule can be found here. The Federal Register contains a copy of EPA’s Clean Power Plan Proposed Rule and can be found here. On June 17, President Obama announced his intent to expand the Pacific Remote Islands Marine National Monument (which covers areas south of Hawaii near mostly uninhabited islands controlled by the United States) from its current size of 87,000 square miles to nearly 782,000 square miles. This action would double the amount of protected marine area globally and is an attempt at trying to help global environmental issues such as ocean acidification, pollution, and overfishing. The president is also teaming up with other federal agencies to strengthen the seafood industry and to help prevent seafood fraud and global black-market fish trade. According to a 2-year seafood study performed by the University of British Columbia, up to 32% of wild shrimp, crab, salmon, pollock, tuna, and other catch imported into the United States are caught illegally. After a public comment period, this marine preservation action is expected to go into effect later this year, creating the largest protected marine preserve in the world. The Cornell Lab of Ornithology is conducting a bioacoustics research program called the Right Whale Listening Network off the coast of Cape Cod. Down the center of the shipping lane they have installed 10 Buoys 5 miles apart equipped with submerged hydrophones that can pick up whale calls for up to 5 miles. After a process of elimination, the acoustics most likely to be a right whale are then relayed back to a 24-hour monitoring crew. The hydrophones hang 60 to 120 feet below the buoys and relay acoustical data to an onboard computer system equipped with special software programmed to focus on sounds ranging from 50 to 350 Hertz. Next, the software estimates each sound’s similarity to a right whale up-call by assessing a dozen characteristics such as duration and the starting, minimum, and maximum frequencies. Right whale up-calls are typically 1 or 2 seconds long and normally do not exceed 2 seconds. Finalizing this process of elimination, the on-board computer will then give each sound a number from 1 to 10, 10 being the most likely to be a right whale. The unit keeps a running tally of the 10 highest scoring sound clips and relays the information every 20 minutes via cell phone or satellite to a server at the Cornell Lab of Ornithology. Ten sound clips per buoy transmission mean that the 10-buoy array can yield up to one hundred 2‑second clips every 20 minutes. Reviewing an entire day’s recordings from all 10 buoys takes analysts 1 to 2 hours. Some days 90% of the clips recorded are actually right whales and some days only 10% are actually right whales. The main recipients of whale alerts are natural gas ships operated by Northeast Gateway Deepwater Port. However, analysts keep an up-to-date Right Whale Sighting Advisory System (SAS) available online and distributed by email. Once a right whale has been detected, all vessels headed to the Natural Gas Terminal are encouraged to slow down to no more than 10 knots. Also, U.S. law requires vessels 65 feet and longer to travel at ≤10 knots in this area during certain times of year (see www.nmfs.noaa.gov/pr/shipstrike for more information). Ten species of marine vertebrate were found buried in four separate levels of sedimentation, suggesting their carcasses had washed ashore in what were then tidal flats during four time periods nearly 6 to 9 million years ago. 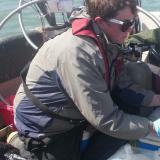 Scientists suggest that the deaths were likely caused by harmful algae blooms. Among the species found were now-extinct walrus-like whales, aquatic sloths, baleen whales, sperm whales and seals. Florida’s governor Rick Scott announced Tuesday that he will propose $55 million in state funds for springs protection in the 2014-15 budget. This is double the funding that has been allocated to springs protection in any 3-year period since 2001. In the past year, conditions in the Indian River Lagoon have developed into a major environmental crisis for Florida due to the deaths of more than 60 dolphins, 250 pelicans, and 120 manatees. Additionally, the number of blue crabs in the lagoon has declined drastically. The Indian River Lagoon is one of North America’s most diverse estuaries, with more than 4,300 plant and animal species, including 35 species that are listed as threatened or endangered. For years many concerns about the health of the lagoon have escalated because of fresh water introduction, which results in decreased salinity, toxic algae blooms, toxic quantities of nitrogen and phosphorus entering the lagoon, and superblooms of phytoplankton, all of which result in a loss of seagrass and the introduction of nonnative invasive species. These conditions can have life threatening effects on the delicate and essential flora and fauna of this region. Many taskforces of scientists are studying and monitoring the health of the lagoon while several agencies investigate the cause of the mass deaths of the dolphins, manatees, and birds. Burmese pythons, one of the five largest snakes in the world, are native to Asia but more than 112,000 of them have been imported into the United States since 1990. Due to their big appetites and top predatory status, these snakes have become a huge problem for the economy as well as for South Florida’s residents, their pets, and many species of mammals and birds. While the struggle to eliminate this non-native species is in full gear, pythons are continuing to spread into other areas of Florida, which seems to be an ideal habitat for these ‘top-of-the-food-chain’ species. One biologist from the U.S. Dept. of Agriculture in Gainesville, Florida, recently invented a live python trap that is currently being tested in South Florida. Other control methods are still in place, such as restrictions against owning a Burmese python as a pet unless the pet owner has been ‘grandfathered in’ by owning one on or before July 1, 2010, in which case pet owners are required to maintain a ‘Reptile of Concern’ license. Click on the links below for more information concerning Burmese pythons. The Pacific pond turtle (also known as the western pond turtle) (Actinemys marmorata or Emys marmorata) is native to the western United States and Mexico. This species is suffering a severe decline in population as well as nesting and hatchling habitats due to wetland drainage, agriculture, development, and predators feeding on their eggs and hatchlings. These turtles, which no longer exist in Canada, are included in ‘Oregon’s Sensitive Species List’ and IUCN’s ‘Red List of Threatened Species’. In order to identify and protect these turtle nests, Dave Vesely with the Oregon Wildlife Institute invented quite a resourceful technique of training canines to sniff out and help locate their nests. Canines have a tremendous sense of smell with their 300 million olfactory receptors (humans have only 6 million). By locating their nests, more resources can be designated to protecting the Pacific pond turtle and save them from extinction. http://www.dfw.state.or.us/wildlife/living_with/docs/turtles.pdf; The Oregon Dept. of Fish and Wildlife website. http://kern.audubon.org/pond_turtle.htm; Southern Pacific Pond Turtles: Biology. The U.S. Fish and Wildlife Service (FWS) have designated 96 miles of North Carolina coastline as critical habitat for nesting Northwest Atlantic (NWA) loggerhead sea turtles. The eastern coastline is comprised of approximately 1,531 miles of shoreline, approximately 740 miles of which are designated as critical habitat. Loggerhead sea turtles are protected under the Endangered Species Act (ESA), and designating critical habitat is vital in identifying which areas need to be protected in order to conserve population density. Q: What impacts would the designation of critical habitat for the NWA population of loggerhead sea turtles have on coastal landowners within or adjacent to these units? A: For the most part, the public would see negligible change in how FWS Service conducts business, now and in the future. FWS would continue to consult on projects federal agencies conduct, fund, and/or permit that may impact loggerhead sea turtles, regardless of whether these projects occur in designated critical habitats. Designation of critical habitat also does not affect land ownership or establish a refuge or preserve. Nor does it generally impact private landowners taking actions on their land that do not require federal funding or permits. Q: What threats to terrestrial nesting beach habitat were identified? The Martin County Hurricane and Storm Damage Reduction Project is a federal project that authorizes construction of a protective and recreational beach along 4 miles of shorefront southward from the St. Lucie County line to near the limit of Stuart Public Beach Park (R-1 to R‑25). The project was initially constructed in 1996 and subsequently rebuilt in early 2005 after direct hits by hurricanes Frances and Jeanne. The most recent renourishment was completed in April 2013 and involved the placement of approximately 510,000 cy of material along the 4-mile project area. The beach renourishment project is designed to provide storm damage protection to structures that would otherwise be threatened by chronic shoreline retreat and storm-induced beach erosion while maintaining an area suitable for recreation and wildlife habitat. The east coast of Florida (including Martin County) supports one of the highest nesting densities of loggerhead, green, and leatherback sea turtles within the southeastern United States. 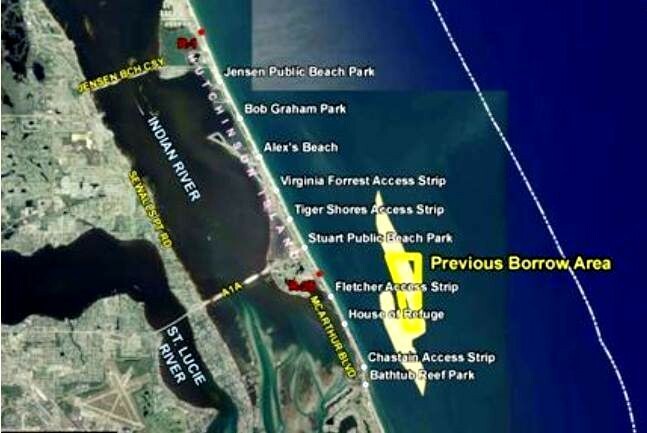 This particular beach renourishment event was unique in that it was selected as a pilot project to study the potential benefits of adjusting the traditional beach nourishment design template to ameliorate some of its negative effects on nesting sea turtles. This effort is supported by Florida Department of Environmental Protection, Martin County, and the U. S. Fish and Wildlife Service, among others. The plan was to construct alternating traditional and “turtle-friendly” segments so monitoring could be implemented in a controlled environment to scientifically verify the performance of the turtle-friendly template without compromising storm-damage-reduction benefits. This construction project design included alternating equal-length segments of shoreline using the historical template with an experimental milder slope construction template. The experimental “turtle friendly” template consists of a construction berm commencing landward at an elevation of +6.5 NAVD88 with a 1 on 50 slope then 1 on 20 to MHW. One-time comprehensive monitoring will be conducted to determine if statistically significant improvements in nest densities and hatchling production can be achieved through modifications to the traditional construction template. Since ANAMAR prepared the Supplemental EIS for this project, we were interested in seeing the project come to fruition. We were invited to visit the site during construction and we have included some pictures from our trip. We hope the turtles like their new beach!